411 Commonwealth is located on the north side of Commonwealth, between Massachusetts Avenue and Charlesgate East, with 409 Commonwealth to the east and 413 Commonwealth to the west. 411 Commonwealth was designed by Little and Browne, architects, and built in 1899-1900 for Robert Stow Bradley and his wife, Leslie (Newell) Bradley. He is shown as the owner of 411 Commonwealth on the original building permit application, dated June 8, 1899. 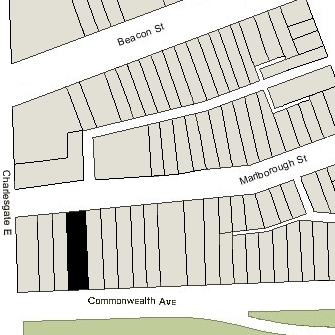 The rear of the lot on which 411 Commonwealth was built extends north to Marlborough Street and has a secondary street address of 460 Marlborough. Leslie Bradley purchased the land for 411 Commonwealth on March 14, 1895, from a trust established under the will of William Dudley Pickman for the benefit of his wife, Caroline (Silsbee) Pickman, his son, Dudley Leavitt Pickman, and his grandson, William Pickman Wharton (the son of William Fisher Pickman and Fanny (Pickman) Wharton, who had died in October of 1880). The land had been owned by Dudley Leavitt Pickman, and he had transferred it to the trust on April 15, 1890 (he was one of the trustees, along with his brother-in-law, William F. Pickman, and Walter Hunnewell). Dudley Pickman had purchased the lot at 411 Commonwealth on April 12, 1888, from Walter Hunnewell. 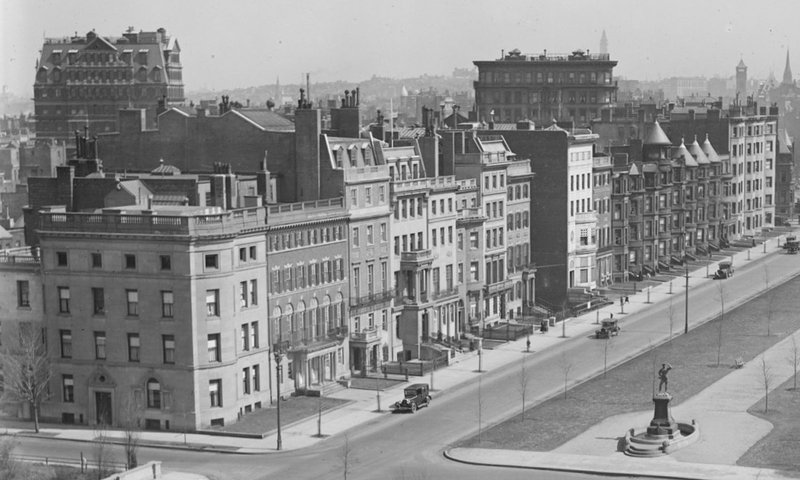 It was the eastern portion of a 125 foot wide lot running west to Charlesgate East that Walter Hunnewell had purchased on December 21, 1885, from a real estate investment trust formed by Francis A. Palfrey, Francis A. Osborn, and Grenville T. W. Braman. The lot was part of a tract of land the trust had purchased on June 1, 1880, from the Boston Water Power Company. When the trustees sold the lot to Walter Hunnewell, they included language prohibiting the use of any building on the land as a stable. Click here for an index to the deeds for 411 Commonwealth, and click here for further information on the land west of Massachusetts Avenue between the south side of Beacon and the north side of Commonwealth. By the 1901-1902 winter season, Robert and Leslie (Newell) Bradley had made 411 Commonwealth their home. They previously had lived at 255 Marlborough. They also maintained a home, Pinehurst, in Prides Crossing. Robert Bradley had served as president of the Bradley Fertilizer Company, founded by his father, until 1899, when it consolidated with a number of other companies into the American Agricultural Chemical Company. He became first vice president of the new company, and was named Chairman of the Board in 1906. The Bradleys raised their four children at 411 Commonwealth: Robert Stow Bradley, Jr., Rosamond Bradley, Leslie Bradley, and Frances Bradley. Robert Bradley, Jr., died in November of 1907. Leslie Bradley married in December of 1912 to Roger Wilson Cutler, a lumber merchant. After their marriage, they lived in Dover. They divorced in December of 1928. In 1934, after several attempts, she was elected to the Massachusetts House of Representatives, representing Needham. In 1948, she was elected to the State Senate, the second woman to be elected to that body, and served until 1969. Leslie (Newell) Bradley died in March of 1919. Robert Bradley continued to live at 411 Commonwealth with his two unmarried daughters, Rosamond and Frances. Frances Bradley married in April of 1919 to Talbot Coggeshall Chase, treasurer of a thread company. 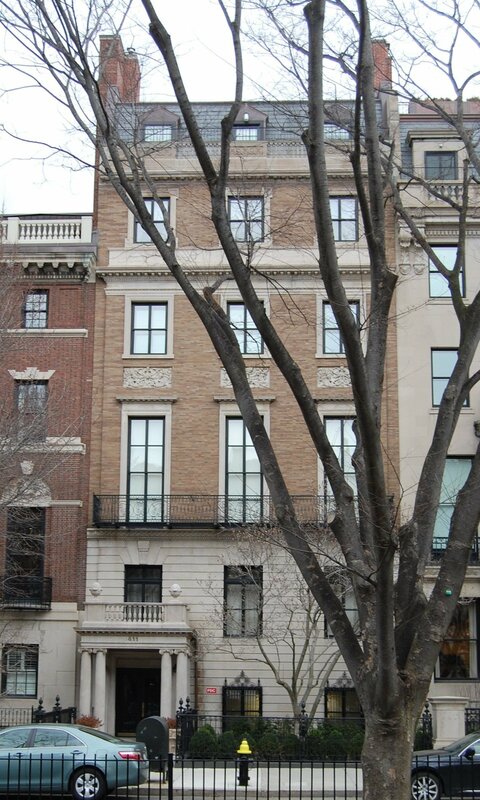 After their marriage, they lived in an apartment at 330 Dartmouth and later in Brookline. Rosamond Bradley married in March of 1923 to Charles A. Rheault, an investment counselor. They had met in 1914, when Rosamond Bradley had been a member of Dr. Wilfred Grenfell’s mission to provide medical services to the native populations in Labrador, and he had been serving with the Royal Northwest Mounted Police, working in the arctic regions. During World War I, she was a Red Cross nurse and he was a Captain in the Royal Canadian Dragoons, and they had remained in contact. After their marriage, they lived in Brookline. Robert Bradley continued to lived at 411 Commonwealth, and in about 1926 he was joined by Charles and Rosamond Rheault. Robert Bradley married again in January of 1927 to Mrs. Florence Heights (Sartori) Thornton Johnson, the former wife of Horace George Thornton and widow of Guy Black Johnson. After their marriage, they lived at 411 Commonwealth and in Prides Crossing. Charles and Rosamond Rheault moved to Westwood in about 1928. In the fall of 1932, Florence Bradley filed for a legal separation and they subsequently lived apart. Robert Bradley continued to live at 411 Commonwealth and in Prides Crossing. 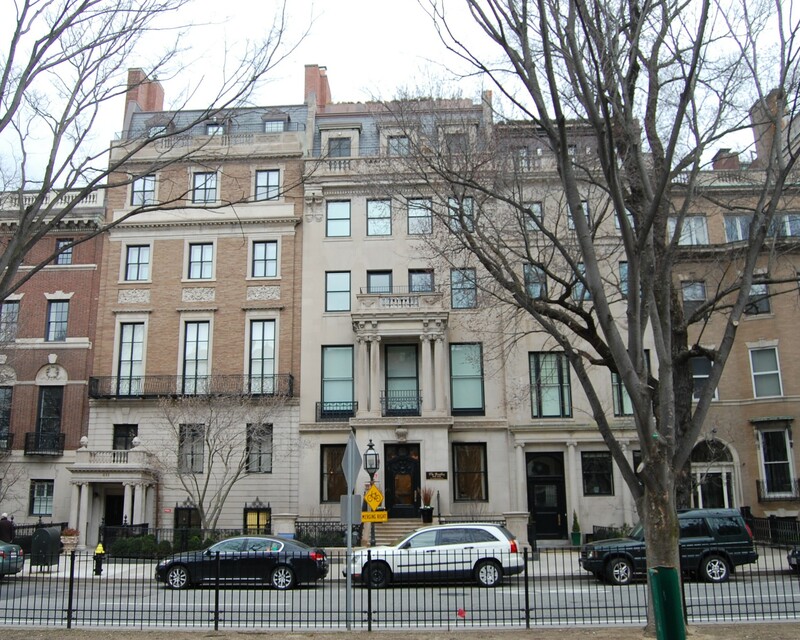 By the 1933-1934 winter season, he was joined at 411 Commonwealth by his first wife’s sister, Lavinia H. Newell. She previously had lived in an apartment at 12 Commonwealth. She was a leader of the Boston Red Cross. She died in May of 1934. William Bradley continued to spend the winter seasons at 411 Commonwealth until the early 1940s, when he made his home in Prides Crossing his year-round residence. On October 9, 1944, 411 Commonwealth was purchased from Robert Bradley by the Garland School of Homemaking (later Garland Junior College). It also owned 409 Commonwealth as well as 337-343 Commonwealth and 413-415 Commonwealth. In November of 1944, Garland School filed for (and subsequently received) permission to convert 411 Commonwealth from a single-family dwelling into classrooms, an assembly hall, offices, and a janitor’s suite. In July of 1947, it applied for (and subsequently received) permission to convert the fourth and fifth floors into dormitory rooms, and in August of 1947, it applied for (and subsequently received) permission to cut openings in the party wall, connecting it with 409 Commonwealth. In April of 1976, Garland Junior College announced that, because of financial difficulties, it was merging with Simmons College. 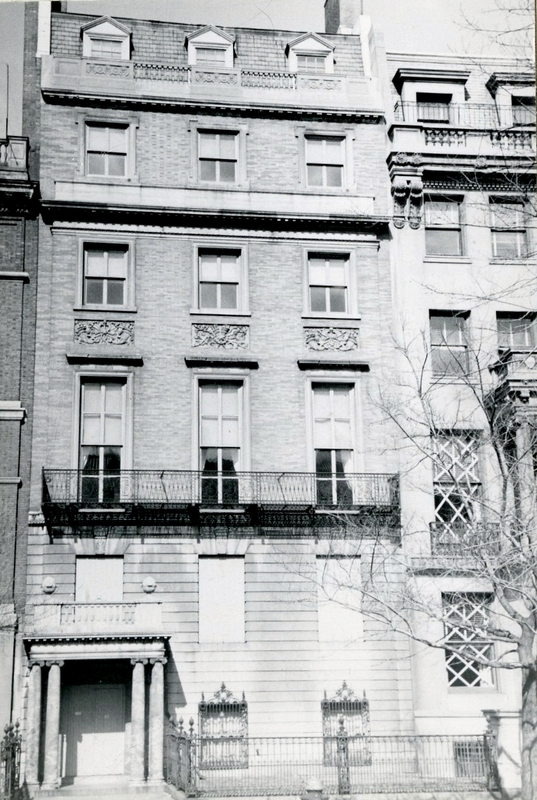 It subsequently sold twelve of its properties and on October 21, 1977, it transferred the remainder – those located furthest west (407-415 Commonwealth, 24 Charlesgate East, and 451 Marlborough) – to Simmons College. On June 28, 2005, Simmons College sold those buildings — 451 Marlborough, 407-415 Commonwealth, and 24 Charlesgate East — to Terra Green II LLC (formed by Terra Mark Development of New York and local partners). The proceeds from the sale were used to finance construction of a new school of management building. Simmons College continued to occupy several of the Back Bay buildings until the new building was completed.